DES MOINES, Iowa (Reuters) - Former Alaska Governor Sarah Palin, who rallied members of the Tea Party in their failed effort to defund Obamacare, lashed out on Saturday against members of the Republican Party who agreed to end the government shutdown. The 2008 Republican vice presidential nominee's comments during a speech in Des Moines come at a time of division within the party over the strategy conservative members of Congress adopted in forcing a 16-day shutdown of the federal government last month. Polls have shown voters blamed Republicans for the shutdown. Palin, who was speaking to hundreds of attendees at the Iowa Faith and Freedom Coalition's annual fall banquet, was joined by Senator Mike Lee, a Republican from Utah. Lee, along with fellow Tea Party movement star Senator Ted Cruz, was instrumental in the ill-fated attempt to defund Obamacare, the popular name for the healthcare reform law championed by President Barack Obama. 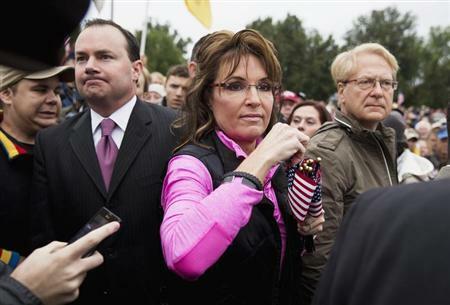 Palin told the Christian conservatives in attendance it was time to "stiffen our spines" for the 2014 elections. "I want to encourage you to make your voice heard, to hold politicians accountable," Palin said. The bulk of Palin's speech was focused on the nation's current political climate. She drew thunderous applause with her sharp attack on Republicans in Congress who voted in October to raise the nation's debt ceiling and reopen the government. "They promised that they would do everything in their power to fight against socialized medicine, against Obamacare, but when it came time to stand and defund it, they waved the white flag of surrender and they threw under the bus the good guys who did stand up and fight for us," Palin said. Palin named Lee and Cruz as leaders in that fight. Last month, Cruz also made a stop in Iowa, a key state in presidential campaigns because the Iowa caucuses are the first electoral event in the nominating process. In 2010 Lee defeated three-term Republican Senator Bob Bennett in a primary on his way to winning the Senate seat. In his speech on Saturday, he called on Republicans to offer up "market-based alternatives" that could replace Obamacare if the Republicans hope to have success at the polls in 2014. "Frustration is not a platform. Anger is not an agenda and outrage, as a habit, is not even conservative," Lee said.